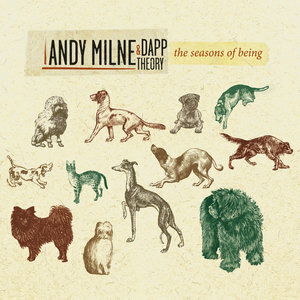 Andy Milne and Dapp Theory, a band known for funk and creativity, play less groove and more beauty on its way to someplace truly original. Pianist Andy Milne made his first splash as a member of Steve Coleman's M-Base collective, appearing on as many as ten of Coleman's recordings. That virtually guarantees that Milne is a skilled improviser and musical thinker with few boundaries between styles and approaches. His own Dapp Theory band, recording and performing in various incarnations since 1998, is Coleman-esque in that it weaves together jazz, funk, hip-hop, poetry, and considerable heaps of modern jazz lyricism. But something about this description might be misleading. Unlike most bands that navigate the jazz/funk/spoken word delta, Dapp Theory rarely locks into a groove as the simple way of catching your ear. Rather, Milne is crafting a thoroughly original fusion that uses almost none of the tropes of pure groove music, preferring instead to build impressionistic arrangements that surprise and delight. The Seasons of Being, his latest Dapp Theory project, is a daring, gorgeous achievement. In addition to his core band (Chris Tordini's bass, Aaron Kruziki on reeds, Kenny Grohowski's drums, and John Moon providing "vocal poetics" on a few tracks), Milne makes liberal use of several A-List guests. Ben Monder is here on guitar, and Ralph Alessi's trumpet is central to many arrangements. La Tanya Hall sings and speaks, Michael Attias solos on alto and baritone saxophone, and either Christopher Hoffman or Jody Redhage plays cello on almost every track. The result is a set of music that lives just as comfortably as a commission for Chamber Music America, as a kind of hip-hop, or as a species of the "new jazz" that mixes complex composition and improvisation in untraditional ways. "Surge and Splendor" is a welcome to the idea of The Seasons of Being—setting forth the thesis that music has the power to heal. The piano trio plays a theme in 3/4 that feels like a sway and a surge, a danceable pulse with a structure that makes it feel like an unbroken circle. The voices make the case in words, and then soloist fly out over it, each with their own personalities on display. Redhage's cello is cerebral. Kruziki's clarinet is structured in written unison with Milne's piano. Monder's guitar is overdriven and powerful, rising like a huge force as Grohowski's drums get more active and explosive, like an ocean below a dark cloud. All the voices come together at the end in a small symphony: Hall's wordless voice blending with Alessi's trumpet, the woodwinds and cello and guitar all spinning gloriously. Most of the recording, however is more pastoral or contained, however. "Ancestree" is a delicate instrumental arrangement that allows Tordini's acoustic bass, Kruziki's clarinet and muted trumpet from Alessi to dapple across the landscape. This sets up a Milne piano solo that sounds like rain falling on a pond, echoing in the background. Rather than distorted and potent, Monder is all shimmering impressionism here. "Satanama" is a through-composed tone poem of glistening beauty, with Monder's sustained guitar tying together brass and woodwind tones. The most traditionally lyrical track is "The Guardian", a feature for Hall's lyrics and singing. Milne plays a chiming pattern through which bowed cello, bowed bass, and Hall's spoken word is gently wound. The sung melody is lovely, snake-like, leading to a cushioned ensemble passage (voice/trumpet, soprano sax/guitar each twinned) and then a long soprano solo from Kruziki that impresses—tumbling up and down with critical blue notes at the right moments. Hall is also prominent on "Capturing the Castle", a riveting arrangement that stretches a slow burn melody with vaguely South Asian tonality out over many minutes. The funk side of Dapp Theory is played down on this outing, though there are tracks where the rhythmic momentum of various kinds of paramount. "The Cusp" begins with a subtle, mysterious set of lower register statements from bass, cello, bass clarinet, and piano. Even after the groove kicks in, Milne leaves plenty of silence in the arrangement as Alessi solos over an off-kilter stop-time feeling. When the band moves into double-time for a closing written theme for guitar and trumpet, your ears remain intrigued and off-center. "Luminescence" is driving modern jazz that puts all the voices on this project into interwoven conversation above a compelling rhythm. But it's "Three-Way Mirror" that comes closest to setting up beats and interlocking rhythms. Even before Grohowski enters, the horns establish a spiraling sense of funk, and the rhythm section then enters to create a lurching kind of acoustic dance pulse over which Moon raps a searching verse or two. The tune then shifts into a moody ostinato pattern in an odd time signature, with Tordini and Milne's left hand booming in an irregular pattern as Hoffman improvises. What you won't hear much of on The Seasons of Being is Milne soloing with abandon. Though he is more than capable, his role here is as composer and colorist, and strictly on acoustic piano. This is Milne at his most Ellingtonian, establishing moods and beginning various patterns that the band will soon take over. It is a mature, careful performance—one certainly easy to miss. Every time you pay attention to the piano parts, they are interesting, vital, subtle. Andy Milne's Dapp Theory is a band that can do just about anything, of course. It's chosen mission here to heal and illuminate, and the work is a success. Gentler and more beautiful than anything else in Milne's discography, The Season of Being is also a work of stubborn individuality. It sounds like little else.